Motion Control Systems, Inc. was founded in 1985 to design and manufacture high performance drive systems for both industry and government applications. 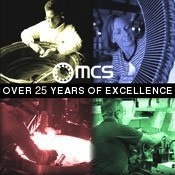 MCS is located in Southwest Virginia in a 26,000 square foot facility near the Virginia Tech campus. The design focus has been on the development of extremely efficient and reliable brushless DC motors and controllers with low torque ripple and cogging characteristics. Systems range from under 1 HP to over 200 HP. These developments were critical to the computer industry in the development and manufacture of high density magnetic and optical disk storage. The same technology and techniques are applicable in other areas requiring high efficiency and low structure borne noise such as precision optical machining and underwater drive systems. Controllers - 4 basic product lines. All amplifiers feature sinusoidal or trapezoidal motor commutation from a variety of feedback devices. Various power ratings are available. Custom sizes and housings available.